September is National Childhood Obesity Awareness Month. At Texas Foot Specialists we see many patients (adults and children) who have chronic foot problems which are linked to being overweight. Studies show that overweight children are highly likely to become overweight adults. Obesity can lead to lifelong physical and mental health problems. 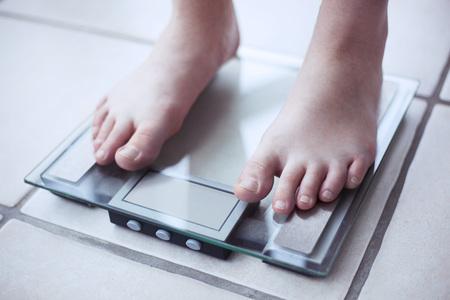 Reduced to its simplest terms, being overweight is the result of more calories coming into the body than are being burned by physical activity. The goal is to make small changes and gradually develop a healthier lifestyle, not just a temporary weight loss. Increase the number of fruits and vegetables served each day. Replace high fat/high calorie snacks with healthier alternatives: substitute baby carrots and hummus for chips and dip, frozen yogurt for ice cream, 100 calorie granola bars for cookies. Involve children in the shopping, planning and cooking of meals. Children are more likely to eat vegetables and fruits that they have picked out in the store. Encourage your child to drink more water. Many times children think they’re hungry but they are really thirsty. Give your child his or her own water bottle and remind them to refill it throughout the day. Park further away from stores where you take your child. Make sure your child has time every day for some physical activity. Develop interests as a family in activities you can enjoy together such as hiking, bicycling and skating. Take a walk after dinner before TV time. If your child has been fairly sedentary, it’s important that exercise and physical activity increase gradually. Be sure that your child has appropriate shoes that fit properly and that stretching takes place before and after physical activity. If your child complains of foot pain, contact our Houston (713-664-6677), Sugar Land (281-242-4448) or Pasadena (281-991-0600) office so that one of our podiatrists, Dr. Gregory Mangum or Dr. Bruce Miller, can examine the foot and find the cause of the discomfort.